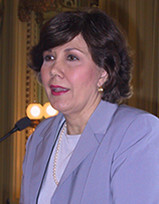 In 1986 conservative pundit Linda Chavez ran for an open U.S. Senate seat in Maryland, against Democrat Barbara Mikulski. Chavez apparently expended a lot of effort on hinting that her opponent was a dyke, inviting "San Francisco-style Democrat" Mikulski "to come out of the closet and debate the issues important to the people of Maryland." Chavez lost big. "I think organized labor -- I think quite mistakenly -- somehow thought that I was going to be their worst nemesis. I had a very nice talk with John Sweeney this morning, by the way, and I don't think [...] that would have been the case. I think I would have actually been very helpful in trying to bridge a gap that exists between the Republican Party and organized labor." My name is Linda Chavez. You may remember me as President George W. Bush's original choice for Secretary of Labor. Big Labor Bosses like the AFL-CIO's John Sweeney pulled out all the stops to defeat my nomination. After all, members of the media were calling me "Big Labor's Worst Nightmare." And they were right! I'm completely opposed to the special privileges given to Big Labor unions [...] powers that no other private organizations have. [...] We can cripple liberal politics in this country by passing the Workers' Freedom of Choice Act. If we stop now, the terrorists win. That's right, she said it: unless we politically cripple the liberals, the terrorists win. During a June 2004 discussion with Dennis Miller about the federal minimum wage, the former Labor Secretary nominee categorically argued against any increase in the wage. But during the interview Chavez revealed her ignorance of a simple fact: the current amount of the federal minimum wage: "You know, I don't know what it is. It's $5-something -- $5.65, something like that -- an hour." Turns out it was actually $5.15, just as it was when she was the Secretary of Labor nominee, just as it had been for 4 years before that. Switched from Democrat to Republican in 1985.